Ventilation in an apartment: supply and exhaust air ventilation with heat recovery. Ventilation of dwelling, in our case – an apartment, begins with a concept – a constructive principle and the main idea of implementing an engineering system. Proper ventilation in an apartment is the organization of air exchange in each zone in order to create a climate that meets all standards and has a beneficial effect on the well-being of the residents. WHAT IS THE CONCEPT OF VENTILATION SYSTEM IN AN APARTMENT? Before the final concept for a specific object is designed and voiced, we discuss all the initial data with the client. As a rule, this process takes about 1 hour. During the consultation, we touch such points as: the main aspects and tendencies in the sphere of ventilation on the Ukrainian market; the process of designing the engineering system; selection of equipment; proper routing of the air ducts, and so on. Together with the client, we analyze the project from cover to cover. As examples, we show certain already implemented projects and explain how they were actually designed and assembled, as well as demonstrate how they look in real life. When clients come to our company, their knowledge about this engineering system is usually on the user level. After the consultation, the person leaves us with a deep understanding of why the ventilation system is necessary, how it will be placed and what benefits it will bring. Our task is to show and tell everything up to minor details, providing practical examples. The next stage after the discussion of the concept will be the development of a commercial offer. What aspects are included in the development of commercial offers? 2. A detailed presentation of the entire ventilation system, starting with the ventilation unit and ending with slot diffusers. Why is it necessary? The ventilation system is designed as a LEGO. In every set there are different parts that correspond their purpose and cost, and our customer should clearly understand why this particulate element of the system is here and its technical explanation. valves – for what reason they should come with a counter spring, which in the absence of electricity, forcibly closes the system. We do our best to explain and show everything to the client, mention the expediency of each element and equipment in the ventilation system. With the commercial offer, the client has a right to search for another company that can offer at least the same individual engineering solution, and not just impose a specification template for 5-6 positions without considering any specific characteristics of the residential facility and the client’s wishes. Let’s talk about the purpose of the specification for each of the parties in the collaboration. system budget and list of benefits it will bring in the future. For my team, this is a phased algorithm for the implementation of ventilation in the apartment, all the stages in which are performed rigorously. The specification is not developed free of charge – depending on the area and the tasks, the cost varies from 400 to 1000 UAH. WHY DOES A DISCUSSION ALWAYS COME FIRST, AND ONLY THEN – THE DEVELOPMENT OF A COMMERCIAL OFFER? We can design the system but then the client will realize that he is not actually able to pay for it. Or there can be a situation when there is no physical opportunity to mount the system chosen by the client. After all, for air ducts we need lowered ceilings. 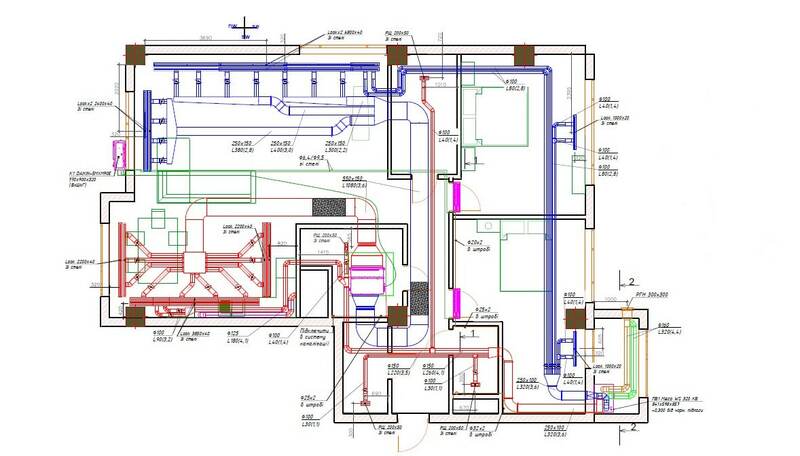 Or there is no possibility to put the ventilation system in the apartment due to the design of the building itself. There are many factors that can prevent the implementation of the engineering system at a particular object. Important! A consultation with the client always comes first, and only after it – the development of the commercial offer. 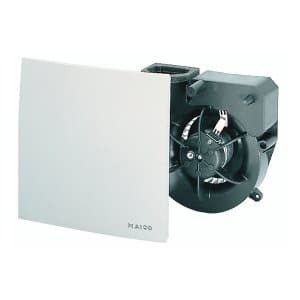 We build the ventilation system for a house or an apartment only on the basis of supply and exhaust systems with heat recovery from MAICO, that are equipped with highly efficient heat exchangers. The project of ventilation in the apartment must be based on strict building standards. We offer the following technical solutions for supply and exhaust ventilation of general exchange type. According to the national building standards, exhaust air from bathrooms is taken out through the exhaust fan and removed through the vent channel, which is initially built by the property developer. We try to ignore this technical moment and organize our system in the following way – we include general ventilation in the integrity of the whole apartment and divide it into 2 zones: the “dirty” zone (sanitary facilities and bathrooms) and the “clean” zone to which we supply fresh air. What does this mean? Supplying fresh air to a clean area, we dispose heat and CO2 through the bathroom. The system is constantly working in a balance. Though, here is one BUT: we have no right to throw this exhaust air duct from the bathroom to neighbors’ under-window area. Thus, if we have the opportunity to place the ventilation grill without disturbing our neighbors, we do it. In a situation where it is not possible to implement the previous solution, we proceed to the following – the inflow is sent to the “clean” zones; we take the exhaust air from the “clean” zones as well and partially pick it up in corridors, in storerooms or in dressing rooms. 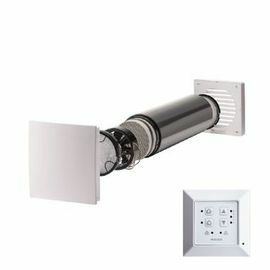 In bathrooms and toilets, we take out the dirty air with independent exhaust fans. We implement all the system on galvanized steel, covered with heat and sound insulation, with silencers and so on (see. Fig. 2). WHAT VENTILATION EQUIPMENT IS THERE ON A MARKET? The ideal solution for ventilation in the apartment is the installations of the leading European brands, which are not only qualitative and efficient, but also energy-saving. These are the brands Maico (Germany), Systemair (Sweden), and others. 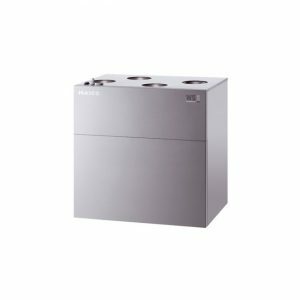 Before deciding on particular air handling unit, we make calculations that depend on the number of aspects: frequency of air exchange, number of resident, total area and other requirements. exhaust system with heat recovery. - Implemented without air ducting. – they are a perfect choice for bathrooms and toilets. They take out both the exhaust air and its humidity, which is very important for this kind of premises. Ventilation systems of apartment "Fountain Boulevard"
When a commercial offer for a particular apartment is fully developed, the next step is the client’s confirmation on the project. After the customer´s approval, we proceed to the design, and this stage is paid by the client – an advance payment of 10% from the cost of equipment for the system project. Any changes in the commercial offer are made after the project development. And then we proceed to the installation (minus 10% paid from the total amount). An important factor at this stage is the quality of installation work, according to the project, without deviation and taking into account all the possible nuances. When designing and calculating, we take into consideration all the details on paper. And everything that we have taken into account on paper, we must mount on the object. Therefore, the huge part of the success of the project depends the installation team, which works together with me and which I absolutely trust the final realization of ventilation in the apartment.